Frequent readers of my blog will know that the reason I have time to write blogs, visit War Memorials and do research in Barnsley Archives is that I have a couple of annoying illnesses which limit my capacity to do a full day's 'proper' work. They also interfere with my ability to get around - I no longer drive and walking is best done when I have someone to lean on. However that doesn't stop me having a good time if I try and last weekend was a really good one. Now the upshot of this gadding around is that when I woke up on Monday morning everything hurt and some bits hurt and were stiff as well - I was doddering around like a zombie for most of the day, not helped by a four hour round trip (on public transport) to Sheffield for one of my regular hospital appointments. As a result I have only just (Tuesday morning) managed to pull myself together to write about the ceremony at Bolton upon Dearne on Sunday morning - sorry about the delay - I think I may have just talked myself out of any deadline limited jobs that might have been on offer too! 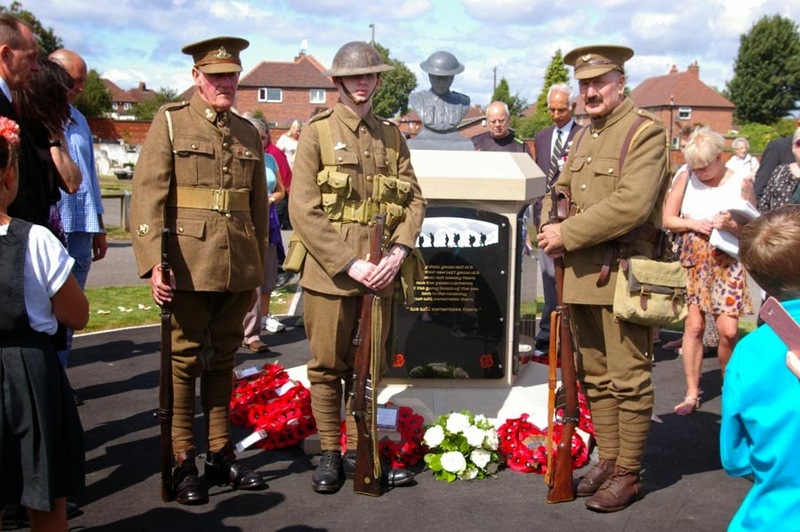 The Dearne Memorials Group, Peter Shields, Peter Davies and Peter Finnegan have been working towards this day for a long time. 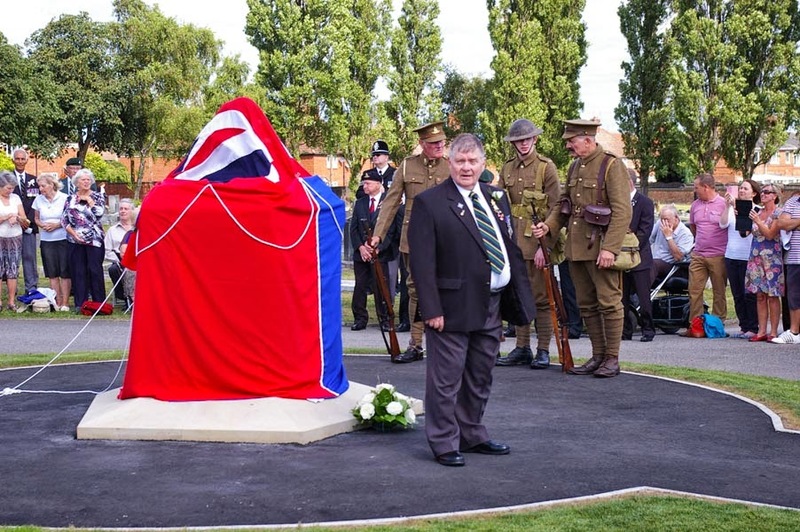 Thousands of pounds have been raised and the stonemasons, C T Butterfield and Sons, were good enough to start work without the full monies having been paid, so don't hesitate to drop something in one of their collection buckets or donate via the Dearne Memorials webpage if you get the chance. The ceremony was well attended with Deputy Mayor Councillor Ken Richardson and Leader of the Council Councillor Steve Houghton present along with representatives from the local British Legion and Scouts Groups bearing flags, a police bugle player and a well behaved group of local Dearne Valley school children who carried out the actual unveiling. As you can see from the photo above there were also a trio of re-enactors in WW1 uniform who added a poignant note to the proceedings, especially as one of them looked to be quite young, just as our soldiers were when they went enlisted in 1914-1918. The whole thing was captured by a crew from BBC Look North and the piece was shown on the Sunday evening news. Peter Shields reminded us that the memorial bears the names of 295 men and women from the Dearne towns of Bolton, Goldthorpe and Highgate. 210 of them had been miners. Fr C R Schaefer, vicar of Goldthorpe and Hickleton, blessed the memorial and later the Revd Karen Beechham from the local Furlong Road Methodist Church spoke a few words. 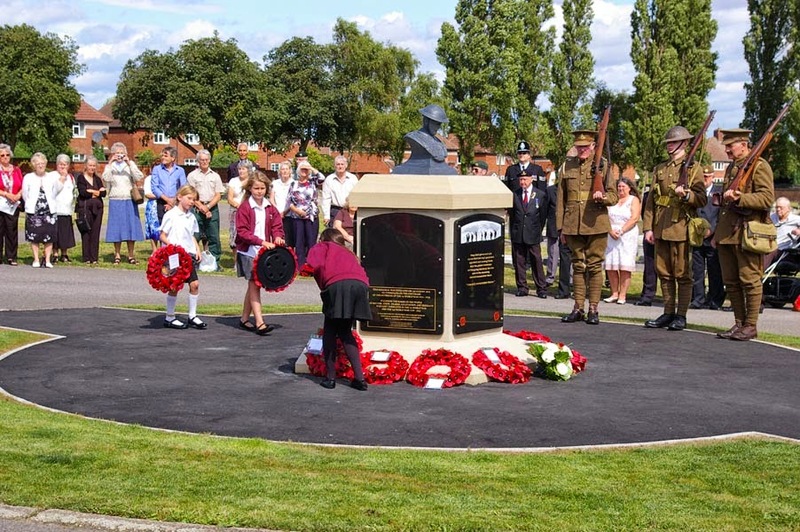 The children played a role throughout the ceremony, working as a team to unveil the memorial, laying wreaths and later placing poppy crosses to remember lost relatives. It was great to see them taking part and I am sure they will remember the day for a very long time. Tea and cakes were on offer in the Methodist Church afterwards where I had a chance to see many more of Peter Davies' photos of local Memorials and stained glass windows. I made a point of shaking Peter Shield's hand and telling him, "A job well done". Afterwards the OH and I walked up to see Bolton upon Dearne's original memorial, at the former Bolton Junior Boys' School site on Furlong Road which was also open for the day. Rescued by a group of local people a few years ago it stands in a small garden just set back from the road. Although there is a memorial plaque in St Andrew's Church (which I haven't got a photo of yet) for a long time the memorial at the school was the only one easily accessible by the whole community. It remembers 45 men who had been scholars at the school. The group which support this memorial have researched the names and are in the process of writing a book about the men and the history of the area. 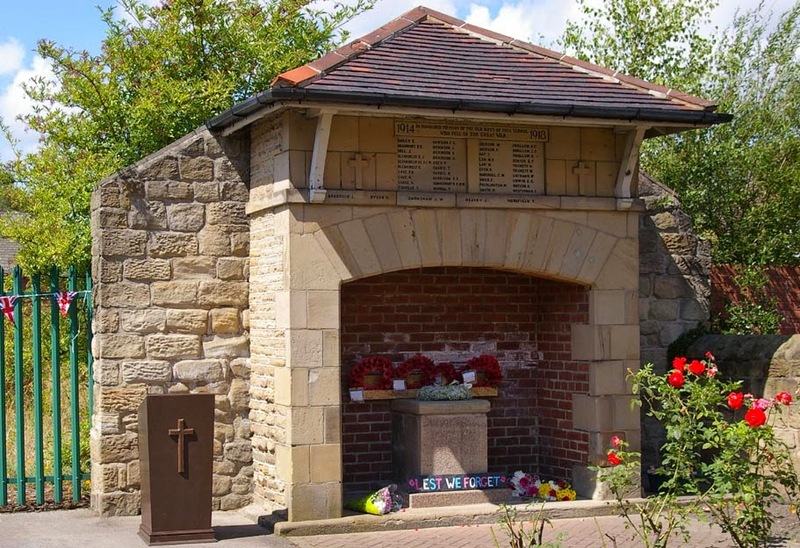 Bolton upon Dearne and the Dearne Towns now have a new central memorial, but I do hope that all the smaller memorials around the district are not now neglected in its favour. I am sure that won't be the case ... but just a thought. Bring them all to the attention of the public in these centenary years, and find those hidden ones! 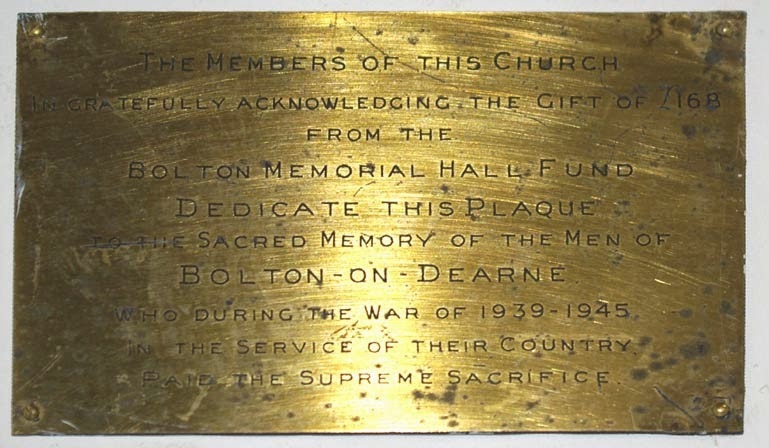 One last thing - as the OH and I were going out of the door of the Methodist Chapel we spotted this - it is a small brass plaque to the "Sacred Memory of the Men of Bolton upon Dearne who during the War of 1939-1945 in the Service of their Country Paid the Supreme Sacrifice". In other words it's a War Memorial by the Imperial War Museum's definition, presumably rescued from the older chapel next door when the congregation move to the new building. I'll be adding this to the Barnsley War Memorials Project log next ... so please remember this ... even the smallest plaque on a table, a vase, a cross, a chair, can be a War Memorial and they should all be respected equally!